Nabarangpur-Online: Doctor Manoj's "Miss Laal Tamator" Inaugurated at Nabarangpur. Doctor Manoj's "Miss Laal Tamator" Inaugurated at Nabarangpur. A book of collected poems titled “Miss Laal Tamator” was inaugurated on Tuesday at the conference hall of district headquarters hospital. 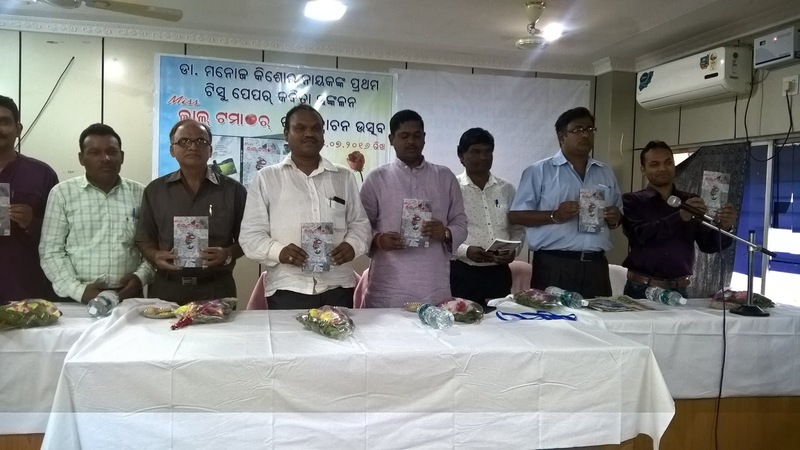 The Author of the book, Doctor Manoj Kishor Nayak, noted the importance of writing poem and making available such books in a manner that attracts readers. The book which includes 138 poems is written in oriya language sheds light on social, national, community and individual affairs. Dignitaries Commerce and Transport Minister Ramesh Chandra Majhi, and Chairman of district planning committee Manohar Randhari, CDMO Doctor Anup Kumar Ghose, Poet Susant Kumar Dash, Editor of Simanta, Ashok Patnaik, jointly launched the book. Odiya Sahitya academy member Booloo Hota presided over the function. The participants of the inauguration event underlined the need to create conducive atmosphere as regards transferring the art of writing poems to future generations. Every person of the district needs to give their contribution to make Nabarangpur rich. Among other ADMO Doctor Sobha Rani Mishra, with doctors and staffs, poets present at the meeting. OUJ district meeting held at Umerkote.